Aussie Gateways Pty Ltd is a Website Management Service. Our links with tourism and business websites enable us to share with you what the valley and region have to offer. While every effort has been made to ensure the information on this site is correct, it is not always possible to achieve complete and total accuracy. Therefore Brunswick Valley Promotions accepts no responsibility for any loss or damages which may occur to any persons as a result of information obtained from this site. Please contact us if you have any thoughts or ideas to share with us. Your comments are always welcome. 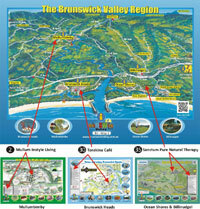 Bill Mills and thank him for the use of the aerial photo of the Brunswick Valley within this web site.